to write his next chapter. But for listeners fond of McGinty's phase/time-coherent approach, Xavian's Roberto Barletta seems primed to take over the vacated slot. 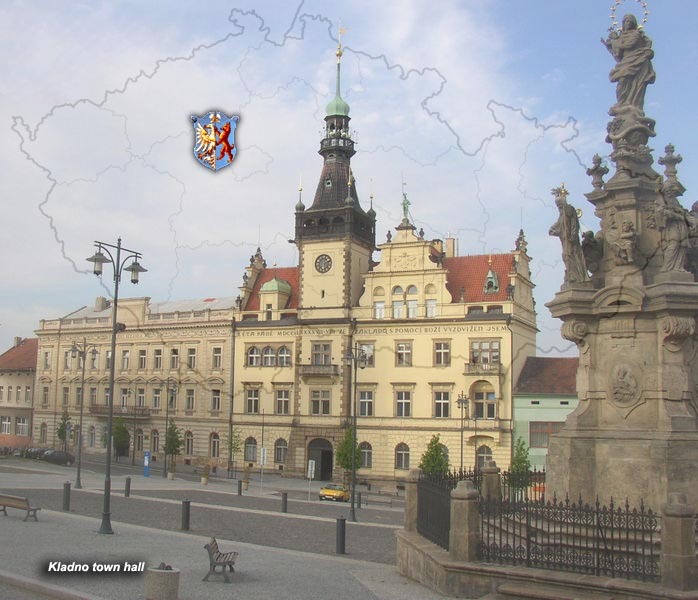 The city's coat of arms below marks the spot: Kladno in the Czech Republic, 25km northwest of Prague, in the central Bohemian region of Středočeský kraj. 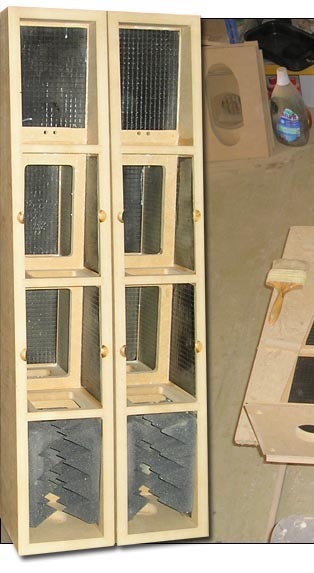 seven internal but inter-connected chambers which are lined with bitumen and polyurethane boards. 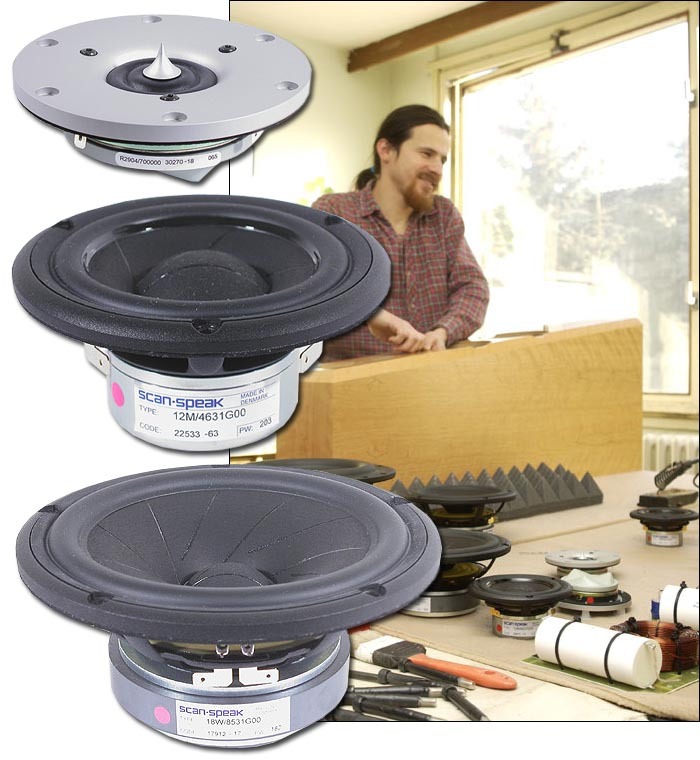 The twin-woofer bass alignment tuned to 25Hz vents out the bottom to ease installation requirements. A magnetically fixed protective MDF mask shows concern both for the speaker when not listened to -- the expensive drivers are out of harm's way from inquisitive fingers and claws -- and when listened to (no grills to obscure sonics). WBT 0730 Platinum Signature bi-wire posts on an aluminum terminal plate with quality jumpers show further concern for quality. About quality, the driver complement of ScanSpeak's finest should have rung your bells already. From the top down, say hello to the 40kHz extension 38mm Ring Radiator with Madonna bra phase plug; 120mm Revelator paper-cone mid with signature slashes; dual 182mm Revelator woofers, likewise slashed. On-axis frequency response at -3dB is given as 28Hz to 40,000Hz, with minimum impedance at 3 ohms, sensitivity at 90dB and crossover transitions at 350 and 3000Hz. 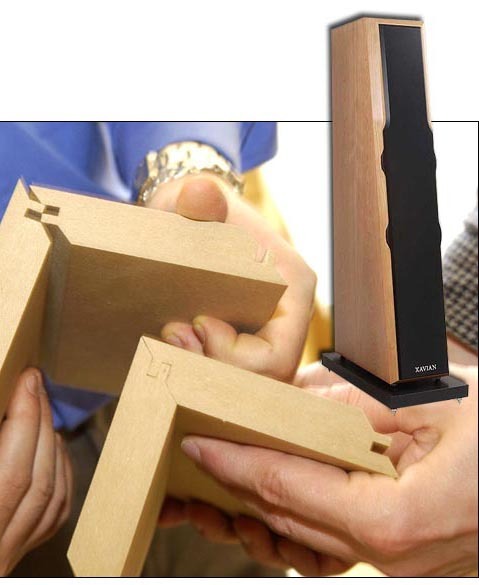 For MDF tongue & groove mitered joinery, a picture tells the story best. 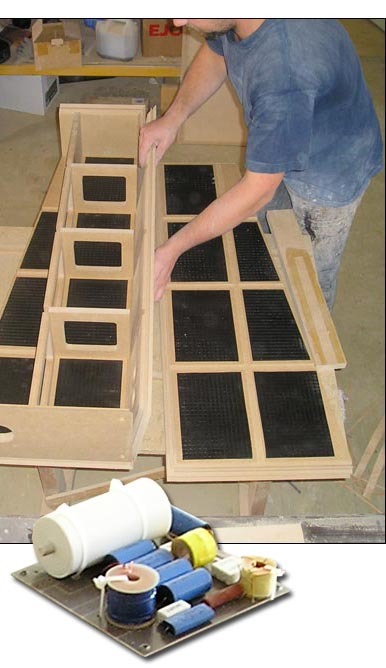 Maximus glue surface means maximum joint strength for a quiet enclosure. The subdivision braces and lining do the rest. 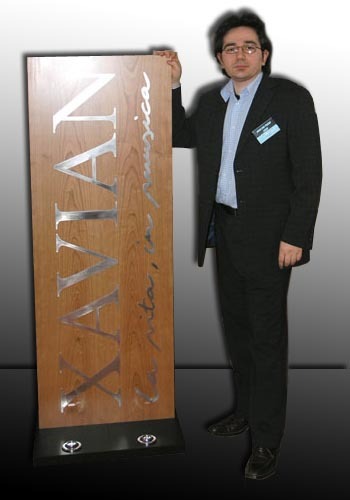 "We are very excited to offer Xavian Loudspeakers to North America! 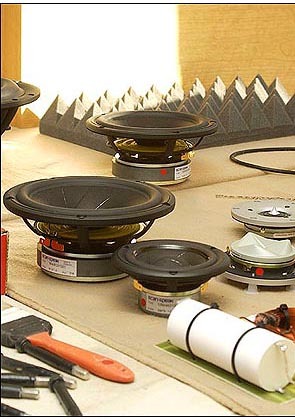 The loudspeaker market is exceedingly crowded and represents little value. We have been watching Xavian for several years now and have been impressed with the quality of workmanship that goes into each product. The joints are not simply glued but mitered with tongue and groove joining. During our recent trip to Europe, we visited the Xavian facility and found each speaker to be hand sanded, soldered and assembled. Mr. Barletta [left - Ed.] and his team are true craftsmen. What sets Xavian apart are low distortion ScanSpeak Revelator transducers with SD-1 motors for the midrange and midwoofers, SD-2 motors for the tweeters; open basket slit cones (to break up standing waves on the loudspeaker cone); custom-machined aluminum port tubes; and high tolerance first-order crossovers. 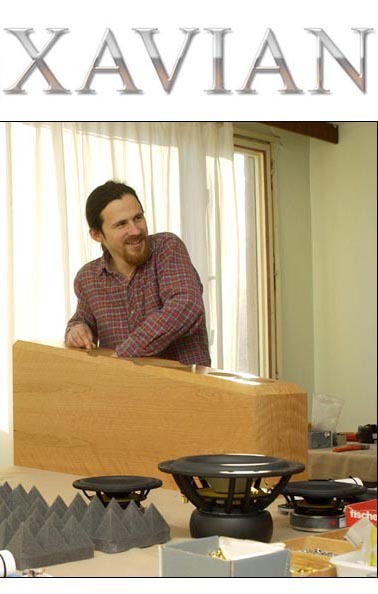 As well built as the Xavian loudspeakers are, their true excellence is demonstrated in their sonic presentation. They have a very natural timbre and tonality. Recently, we attended a piano concert and a wind ensemble (it is important for us to listen to live music on a regular basis). 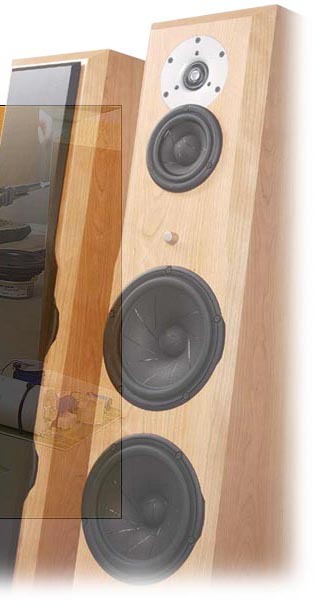 Upon returning, we took some time to listen to the Xavian XN125 loudspeakers. With the live music fresh in our ears, we noticed a striking similarity in timbre, tonality and presentation, albeit on a much smaller scale. We are very excited to add Xavian to our lineup and also to offer a product we feel represents high quality at affordable pricing." About which, Halfnote Audio offers the XN360 for $11,900/pr in Cherry, Maple, Walnut and Nero while Bird's Eye Maple commands a 15% surcharge.